November 20, 2017, UK- Prince Harry launched this year’s National HIV Testing Week, attending the opening of an HIV pop-up shop in London. The Prince attended the opening of the Terrence Higgins Trust (THT) shop in Hackney, East London, on Wednesday November 15 to officially launch the start of National HIV Testing Week, which the charity coordinated on behalf of HIV Prevention England. His Royal Highness helped volunteers hand out self-test kits from behind the counter, before seeing how at risk groups are engaging with the National HIV Testing Week campaign in the pop-up’s ‘social media zone’. National HIV Testing Week, which will run from 18th – 25th November, aims to increase awareness and acceptance of HIV testing, by dispelling the stigma that surrounds the disease. 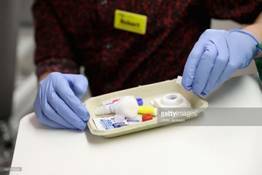 The week, which promotes the benefits of regular testing and treatment, also raises the importance of increasing opportunities to test – be it in clinical settings, in primary care, through community-based rapid testing or via postal testing – in order to improve early diagnosis and treatment of HIV, thus reducing onward transmission. The ultimate goal is to increase regular HIV testing in the most affected groups. Self-testing is an innovative, new way for people to learn their HIV status quickly, easily and within the privacy of one’s own space, be it in a kitchen, bathroom, car or office. With proven HIV self testing technologies, people can test themselves and have a result produced in less than one minute. The decrease in anxiety with a one minute test and the opportunity to be able to do it privately can be an effective way to improve diagnosis and reduce new transmissions. 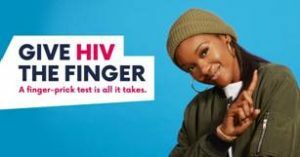 The campaign for this year’s National HIV Testing Week, is to give HIV the finger by getting tested. 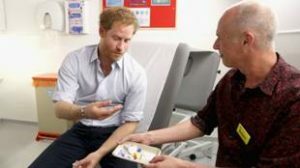 Be the first to comment on "Prince Harry Launches National HIV Testing Week"